Challenger’s work is a powerful interplay of op-art and constructivism. 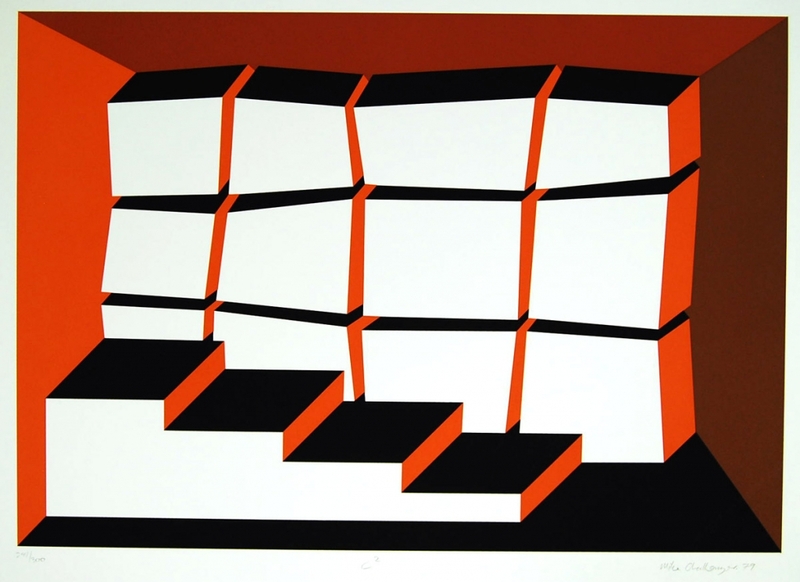 His graphic work evokes the counter-play of shapes, forms and color of his predecessors, including Albers and Escher; but in a stronger and yet playful way. Michael Challernger studied at the Goldsmiths’ College of Art (1960-64) and the Slade School of Art, London (1964-66). In the following years he taught at the Slade School, Goldsmiths’ College and the Chesterfield College of Art. He is a member of the Printmakers’ Council of Great Britain and was recipient of the Sainsbury Award in sculpture in 1966. It is also interesting that Challenger credits the minimalist french composer Eric Satie with inspiration for his geometric work. It was from this musical notion of dissonance and resonance that his work emerges. Education: 1960-1946 Goldsmiths College of Art, London; 1964 Slade School of Art, London. Awards and Honors: Taught at the Slade School of Art, Member of the Printmakers’ Council of Great Britain, received the Sainsbury Award in Sculpture. Exhibitions: Numerous one man shows and group exhibitions since 1964 including Oxford College, the International Europhahaus, Vienna, the Fenna de Vries Gallery, Rotterdam, and many others. Collections: including, but not limited to: Atlantic Richfield, New York; Victoria and Albert Museum, London; Drake University, Durham, North Carolina; Bowdoin College Museum of Art, Brunswick, Maine; The Jewish Federation, Pittsburgh, Boston College, Massachusetts; and many private and corporate collections throughout the world. Michael Challenger seems obsessed with meticulous smoothness. His work depends on precision. Challenger’s paintings, sculpture, and prints explore a curious and fascinating world of perspective distortions. What he deals in are visual impossibilities, but impossibilities of a subtle, rather than a brutal kind. The handful of pieces the gallery has room to exhibit unleashes a whole battery of virtuoso effects. As my foot gingerly searched for an eccentrically placed rung when descending from Michael Challenger’s dingy loft studio, he compounded my discomfort with the warning: “Mind the steps. They’re in perspective.” This characteristic observation could well be used to summarize the work of a printmaker/sculptor who, after a very successful exhibition in Verona, is now set making himself heard in London, Detroit and New York. If one had to label his work, one might describe Challenger’s witty two-dimensional images as visual epigrams. He positions his solid-looking configurations in empty space where the onlookers’ perceptions are stretched to the limit to understand where the illusions occur and if they are relevant to the central idea. Although Challenger ably plots new horizons with his illusionist scenery, his concern is more with the credible realization of improbable figures without alienating his audience with an esoteric language. He uses simple units and the flat, hard-edged colours are deployed with cool detachment and yet, in spite of clear-cut geometric shapes, his paintings always defy one interpretation. Most remarkably, Challenger is able to translate these ideas into stove enameled steel sculptures without sacrificing the wit or disquiet of his paintings and it is as a sculptor that Michael Challenger is undoubtedly going to make his mark.